Aleister Crowley, for those who aren't familiar with him, was either an occult-clothed conman, a deeply evil black magician, or godfather of New Age enlightenment. Or perhaps all three. In any case, he arguably casts an even longer shadow than Richard Shaver, so I'll refrain from summarizing his more general personal history. 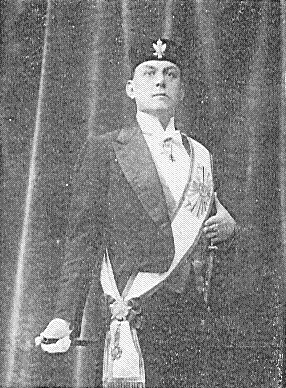 Aleister Crowley in Masonic regalia, circa 1904.
announced plans to build a headquarters patterned after the sun temples of the ancient Chaldeans, with exotic furnishings, fountains spraying jets of perfumed water amid burning jars of incense, silken divans for the faithful to "worship and recline on." Apparently, discussions went poorly, and the Supreme Grand Council fell apart by the end of the year. Crowley left town, and more or less gave up on the project of absorbing the Masonic world into the O.T.O. Beyond his involvement in Masonic maneuvering, Crowley appears to have had a few other things to occupy his time. While the Supreme Grand Council was underway, Crowley was apparently able to convince Albert W. Ryerson, a 32nd degree Mason and manager of the Universal Book Company, to publish an issue of Equinox, Crowley's irregularly produced journal of occult speculation. This issue in particular is notable for including The Manifesto of the O.T.O. Based on Crowley's own recollections in The Confessions of Aleister Crowley, this apparently didn't go too smoothly. The 1948 newspaper article cited above claims that Crowley eventually filed suit against Ryerson. Crowley may not have had much to complain about; Equinox got published and Universal's shareholders accused Ryerson of spending $35,000 of the firm's money in connection with Crowley. So, Crowley came to Detroit for a year, didn't gain any traction, and left. So what? Well, first, any story in Detroit during or immediately WWI might reasonably feature Crowley making waves in the occult/fraternal community. Second, one could reasonably imagine a world where Crowley had succeeded in absorbing the Valley of Detroit branch of the Scottish Rite into his sphere of influence. This could lead to Detroit becoming the Paris of the occult underground. One of the innumerable branches of Crowley's O.T.O. has provided a brief biographical sketch for your edification. The good folks at Mastermason.com have provided a terrific summary of Crowley's interactions with Freemasonry around the world, and his Detroit efforts in particular, can be found in Forbidden. Finally, Hermetic.com presents a complete copy of The Confessions of Aleister Crowley; Chapter 72 covers Crowley's views on Freemasonry.